Continuing to develop my fantasy background using the Classic Traveller ruleset, I’m equipping my two characters with some necessary kit for their foray into the local dungeon. Magroc and Tayllin decide to hit the blacksmiths and hardware stores that have sprung up around the dungeon, in the city of Spar-Kres. Magroc, with his greater disposable income available, can afford to splash out and get himself some decent kit. Now they’re equipped, they hit the city streets looking for a dungeon to try their hand. I’ve imagined the city streets of Spar-Kres something like a bazaar where street traders try to encourage adventurers to try their hand at their dungeons. 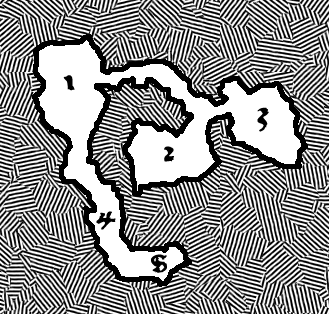 The traders make their money through adventurers having to pay a small fee to enter the dungeon and the monsters contained within being good enough to defeat the delvers. Magroc and Tayllin walk through the hustle and bustle of the bazaar and come across the ‘Dungeon of the Black Star’. The man gives the two characters some great sales patter about the fabulous treasures and challenges that lie below. So Magroc and Tayllin decide to take their chances and pay the man the entrance fee of 50 groats each and walk through the gates into the waiting area. The man gestures to the two expectant delvers and opens a wooden door sporting a black star symbol, painted across the two doors. They walk through and light a torch, stepping onto the damp descending steps. Looking at the map, they are starting their decent from the tunnel at the bottom of the map (‘S’) towards location ‘4’. I’ve placed a trap for our intrepid duo to dodge, so to here’s how I intend to deal with traps and saving rolls. In Tunnels and Trolls, saving rolls were determined by difficult by ‘level’ rolling against the luck attribute. I’m going to use a similar system where a level of difficulty corresponds to a difficulty modifier, its a nice simple approach that I feel matches the straightforward ruleset of Classic Traveller. Magroc leads the pair with the lit torch, trying to keep their footing on the damp, mossy stones. Suddenly, Magroc hears a click – so at this point I’ll get him to make a level 2 saving roll against dexterity, being as its a dodging roll. The base number for success is always an 8 on 2D. As it’s a L2, there is a +1 modifier so he’s got to get a 9 or above. He rolls a 10, sees the spiked metal grille falling from the ceiling and deftly dodges out of the way. The grille hits the floor with a clatter, out of the way of harming the delvers. This entry was posted in Classic Traveller, Mongoose Traveller and tagged Barbarian, Classic Traveller, Fantasy Traveller, Grond, Rogue. Bookmark the permalink.